The internet has got to be a teachers best friend. So many ideas, so little time. Here are a few of my latest favorite finds, most of which I will be implementing into my classroom this year. RockStar Clip up/Clip down behavior Chart - I already made this and it looks SO cute. Crate storage seats - anyone want to make me some of these?? Standards and Benchmarks Posters - all made and ready to go! These make it super easy to switch out benchmarks each day, without rewriting all over the white board. 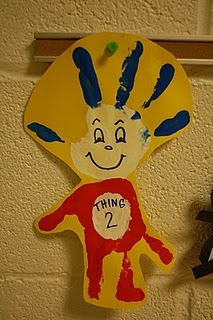 Handprint Things - perfect for Dr. Seuss day on march 2nd! Sad that summer is coming to an end, but looking forward to a new year!